However, we were there for lunch, so something a little more substantial was called for. Everyone was happy with their choice. Service was efficient. I would like to go back and try the high tea. It's autumn (fall) in the US, so Kayte has chosen the seasonally appropriate theme of "This Spud's For You" for Eating with Ellie. Of course, potatoes are good at any time of the year, and in cool Melbourne, I am not dreaming of icecreams and seafood on the beach yet. I made Ellie's Rosemary Potatoes from So Easy. These potatoes are so easy to make - just chop red potatoes in half, spray with olive oil, sprinkle with salt and rosemary, and et voila - a beautiful side dish is created. To see what the others made this week, visit the LYL section of the EwE website. The second recipe for Tuesdays with Dorie this month is Pear Tart with Crunchy Almond Topping. To see what the other TWD bakers made this week, visit the LYL section of the TWD website. It is Tim's birthday today. Originally, I wanted to make him a cake containing raspberries, but I didn't find anything that inspired me. Instead, I turned to my newest baking book, Classic German Baking by Luisa Weiss. My mother's family were Germans and Prussians who emigrated to Australia in the 1870s, so I have a very strong interest in German baking as my way of connecting to them. 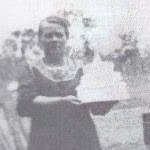 Luisa is an Italo-American who lived in Germany during part of her childhood and who married into a German baking family, hence the inspiration for her book. The recipe that I chose to make for Tim is Dunkler Kirschkuchen (literally, a dark cherry cake). I chose it because the flavours (chocolate, almond, cherry) sounded wonderful, I had all of the ingredients, and the cake sounded festive enough to be a birthday cake (there is no photo of it in the book). The cupcake was slightly drier than I imagine the larger cake will be because I just approximated baking times (and talked on the phone while it was in there! ), but the flavour was awesome - chocolatey, nutty and spicy (from the cinnamon, allspice and nutmeg). 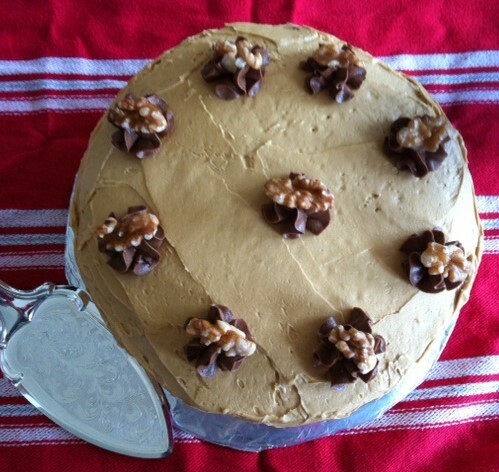 The toasted almonds gave the cake a lovely varied texture. The cake itself took around half an hour longer than the baking time stated in the book because the batter is very moist from the cherries - the middle took quite a while to set, hence my theory that the cake itself will be moister. While baking, this cake smelled just like Christmas because of the lovely spices. Luisa said that this cake is usually only made in autumn or winter in Germany - that makes it perfect for this year's Melbourne spring. 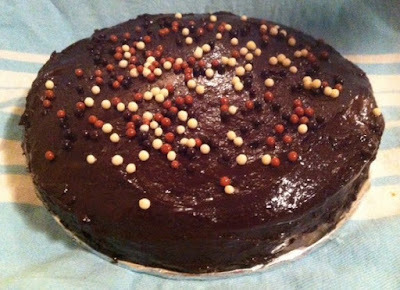 The day I made this cake, it rained, hailed, shone and blew a gale in alternating cycles all day, and the temperatures were woefully cool for this time of year. Preheat your oven to 180 degrees Celsius and grease and line the base of a 9" springform pan. Melt the chocolate in a bain marie or microwave and set aside. Grind the almonds into a fine meal. Beat the butter and sugar together in the bowl of a stand mixer until light and fluffy. Beat in the egg yolks, one at a time. In another bowl, combine the ground almonds, flour, cocoa powder, baking powder, cinnamon, allspice, nutmeg and lemon zest, then beat into the butter mixture until just combined. Add the melted chocolate and fold in to combine. In a separate bowl, beat the egg whites with the salt until they hold firm peaks. Fold one third of the egg whites into the cake batter to lighten it, then fold in the remainder of the whites until no white streaks remain. Scrape the thick batter into the prepared springform pan and smooth over evenly. Top the cake with the cherries, pressing down gently but do not press so hard that they sink into the batter. Bake in the oven for 45-50 minutes or until cooked through (mine took half an hour longer). Cool the cake in the tin on a wire rack for 10 minutes before unclipping the springform collar and allowing the cake to cool completely on the wire rack. You can serve this cake dusted with icing sugar and with sweetened whipped cream if you like. I did neither, as I gave the whole cake to Tim simply placed on a homemade cake board and wrapped in gladwrap so that he could take it to share with his family for his birthday (which is today). Recently, Donna Hay Magazine celebrated its 15th birthday. I couldn't resist buying the 15th anniversary edition, as it had a gorgeous white meringue covered cake on the cover. I have tagged a few recipes, but the only one I have made so far is the Sticky Chicken Meatballs with Coconut Rice on p66. I was intrigued by the meatballs because they contain panko breadcrumbs. While I am not a huge lover of meatballs, I did like these. The coconut rice was a lovely side dish to serve them with. Put the mince, kaffir lime leaves, breadcrumbs, ginger and half the oyster sauce into a bowl and mix to combine. Roll tablespoonsful of the mixture into balls. Heat the oil in a large frypan, then add the meatballs and cook for 6-8 minutes, turning as necessary, until golden brown. Add the water and the rest of the soy sauce and cook for a further 2-3minutes or until slightly reduced and sticky. Stir the coconut milk through the hot rice. Divide the rice between 4 plates, top with the meatballs and glaze, bok choy and coriander. Enjoy! Peggy has selected this week's Eating with Ellie theme, An Apple a Day. Initially, I was going to go for a savoury recipe, but most of those were salads, and it was far from salad weather in grey, cold, rainy Melbourne. 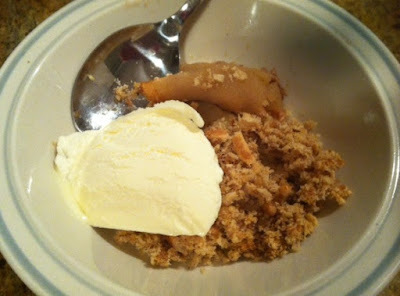 Instead, I went for an intriguing recipe for Apple Brown Betty in So Easy. This recipe was intriguing because the crumble on top of the Brown Betty was made primarily from brown bread crumbs, with crushed walnuts mixed in. I really liked this dessert - it was so light, and very tasty. If you are an apple crumble fan but want to eat more healthily (ie keep off the butter), then this could be the dessert for you. To see what the others made this week, visit the LYL section of the Eating with Ellie website. "Dark and Sumptuous" - don't those words draw you in, regardless of what they may be describing? In this case, they refer to Nigella's Dark and Sumptuous Chocolate Cake, and they make me automatically want to lick the spoon. I got the recipe from Simply Nigella, but you can also find the recipe online here. Even better, watch Nigella make it here. 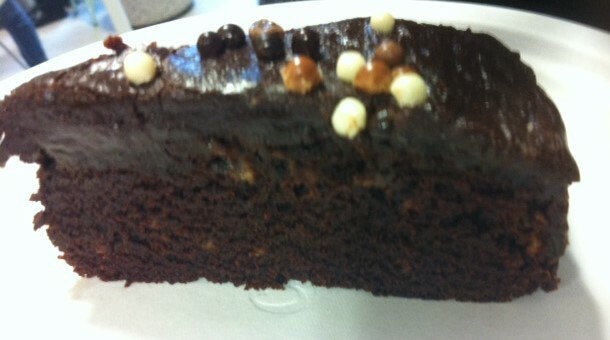 The cake itself is flavoured with cocoa, not chocolate, while the icing does contain rich melted dark chocolate. 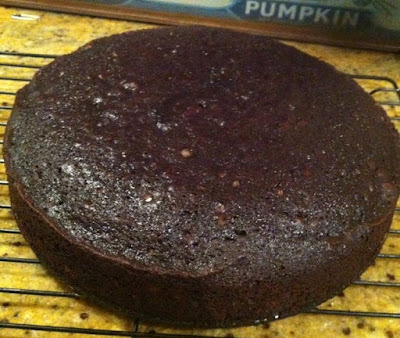 The cake contains coconut oil, while the icing contains coconut butter, which adds to the moistness and flavour of the cake. Don't let the requirement for coconut butter deter you - you can use margarine instead, and if coconut oil is not your thing, you can use a vegetable oil. This was a gorgeous, easy to make cake, and I would definitely make it again. For my birthday this year, Tim took me to Sunday lunch at Cutler & Co in Fitzroy. The set Sunday lunch menu ($75) is meant for sharing, and it changes weekly. I loved my dessert - the flavours and textures went together very well. The service at Cutler & Co was very good - the staff were attentive, and the dishes moved quickly. Because we were seated near the kitchen, some of the chefs even took the time to talk to us about the dishes. I really enjoyed my experience at Cutler & Co, and would visit again. On the weekends, I like to treat myself to a cooked breakfast. Jamie's Every Day Super Foods has some terrific breakfast recipes, and they mainly use ingredients that I would normally have on hand, so it's no trouble to cook them. A couple of weekends ago, I made Jamie's Mexican Pan Fried Brekky - Eggs, Beans, Tomatoes and Mushrooms. You fry up some tomatoes and mushrooms, then crack eggs into the pan which you slosh around a bit so that the whites coat the pan and form a dish for the rest of the components, then add black beans and Worcestershire sauce. Season with salt and pepper and cook until the eggs are done the way you like them. Breakfast is ready! This is a lovely, healthy, hearty breakfast, and is also vegetarian. It's a great way to start the day. Oops! I made my Tuesdays with Dorie recipe for this week - I just forgot to post about it. Well, better late than never, I say. I made the Custardy Apple Squares (I have also made the Pear Tart but you'll have to wait for that one!). This little treat was dead easy to make, so long as you own a mandolin to slice the apples thinly. 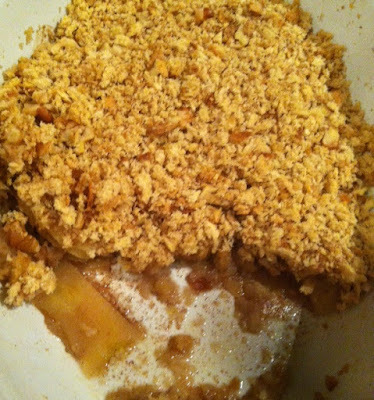 It comprises sliced apples baked in a custard batter then cut into squares - and that is it. I really enjoyed these pleasant tasting custardy apple squares. They were not fancy, but they were good. EwE - Savoury Peach Chicken - It's Peachy! This week's Eating with Ellie theme is It's Peachy!, chosen by me. The obvious thing would have been to choose a sweet dish, but I went for savoury instead and chose Ellie's Savoury Peach Chicken. Blame Blogger for the ridiculous angle of the photo for this post - I am sick of fighting with this flaw in the application. Google, please put a photo rotation feature into Blogger. This dish was terrific - very tasty, and I like the sweet and salty combination that comes with meat and fruit in a dish. The sauce on its own is devine. 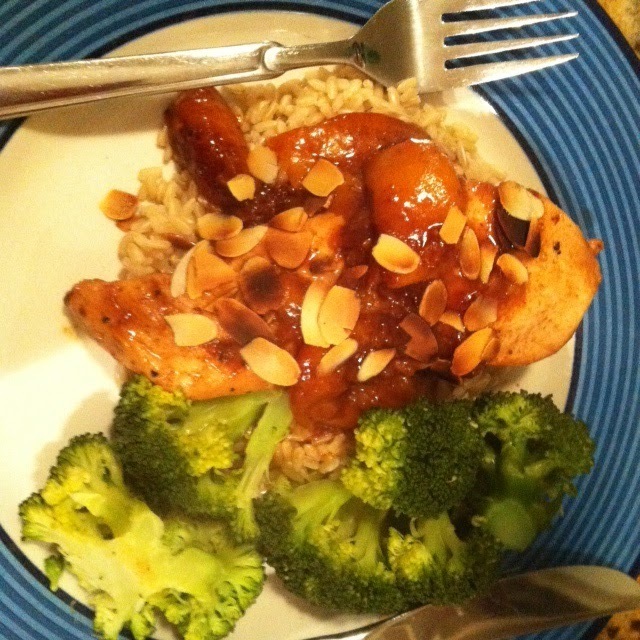 I served this dish with steamed broccoli - easy and tasty. To see what everyone else made for this week's theme, visit the LYL section of the EwE website. When looking for dinner inspiration, I took account of the fact that I had chicken breasts in the freezer, and hit The Hairy Dieters' Book 2, The Hairy Dieters Eat for Life, for recipes. I found a recipe for Easy Chicken Bake, which is also online here. As the Hairy Dieters say, this recipe is dead simple. Toss some chopped zucchini, tomatoes, red onion, sweet potatoes and capsicum into a baking dish with a few chicken breasts, season with salt, pepper and chilli, and bake. In no time at all, and with minimal effort, you end up with a healthy, satisfying meal. This dish is the kind of thing that, for ease and results, could become a family favourite. Unfortunately, due to administrative arrangements at my Pilates clinic, I once again have to say goodbye to a Pilates instructor. This time it was Treena, whose days are being swapped to fill in for someone else going on extended leave. 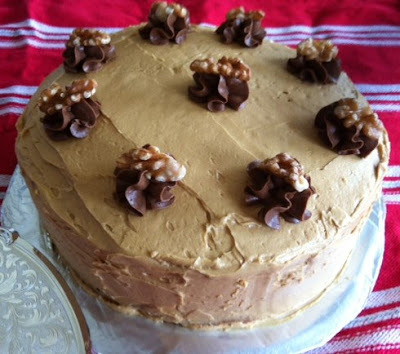 Treena has always been interested in and appreciative of my baking, so I baked her a cake all of her own for our last Monday class together - a Walnut and Coffee Cake from Lomelino's Cakes. The other changes that I made to the recipe were to not bother splitting the two layer cakes into two, so I had just two layers instead of four, and not including the cream in the frosting so that it had better keeping qualities. Preheat your oven to 180 degrees Celsius and grease and line two 8" layer cake tins. Dissolve the coffee powder in the boiling water and allow to cool. In the bowl of a stand mixer, beat together the butter and sugar until light and fluffy, then beat in the eggs, one at a time. In another bowl, mix together the flour, baking powder and baking soda. Pour the flour mixture and the ground walnuts into the batter and beat until well combined. Divide the batter evenly between the two cake tins and bake for 25 minutes or until cooked through. Remove the cakes from the oven, cool in the tins for 10 minutes, then unmould onto a wire rack to cool completely. For the icing, dissolve two tablespoons of instant coffee powder in 1 tablespoon of hot water, then set aside to cool. In the bowl of a stand mixer, beat 150g of butter until almost white, then beat in 1 1/2 cups icing sugar, the cooled coffee mixture and 2 tablespoons of Kahlua. Beat until light and fluffy. To assemble the cake, place one cake layer on a cake board or plate, and spread one third of the frosting over that layer. Place the second cake layer on top of the iced layer, then spread the remainder of the frosting over the outside of the cake. If you like, reserve about half a cup of frosting, stir in a tablespoon of cocoa, and place that icing into a piping bag fitted with a star tip and pipe rosettes on top of the cake. Top each rosette with half a walnut. Zumbo's Just Desserts was a TV reality show about every day people making patisserie, being judged by Rachel Khoo and the master himself, Adriano Zumbo. It wasn't scintillating viewing - until towards the end, when there were fewer contestants and more crazy Zumbo tests, I found it quite slow and either skipped it or just watched bits and pieces while I channel surfed. However, as you can imagine in a show featuring Adriano Zumbo, there were some amazing Zumbo creations that were set as Zumbo challenges in the elimination contests. Miniature versions of these challenge creations were sold in Zumbo stores from Friday to Sunday following the show on which they were featured. It was too expensive to buy all of them - these special creations cost from $11 to $15 a pop - but I couldn't resist trying a few when I was in the vicinity of a Zumbo store. I wasn't greedy - I shared every single one of them with a friend. That is why all of my photos were taken out and about - no styling here, and for one of them, I cut it in half with the cover off a magazine as that was the best I had. At the top of this post is my personal favourite, the Golden Ducky, on cuteness factor alone. This one comprised steamed gingerbread sponge, passionfruit peanut caramel, honeycomb mousse, peanut crumble sable, peanut butter cleam, passionfruit gel and honeycomb - oh, and a chocolate golden ducky! It wasn't as impressive as the full-sized one on the show which bubbled with coconut bubbles created with dry ice, but it was still pretty impressive. For week one of the show, I tried two of the three desserts. This one was pretty hard to cut in half, even with a plastic knife on a park bench, so it looks a little messy, but you get the idea. It was as light as a feather to eat - hoping that means it had no calories! The chocolate petals and butterfly on top were a nice touch. All of these desserts were pretty tasty, but as I said, I loved the Golden Ducky best because it was just so darn cute. Hats off to Adriano Zumbo, who is amazingly creative to come up with all of these wacky, attractive and delicious desserts. I don't have the patience to make such things, let alone anything else (umm, like actual talent), so it was fun to experience a slice of the Zumbo's Just Desserts action through Zumbo's stores.